One of the best ways to explore the charming towns of Marin in the evening? The classic dinner and a movie date night combo. Of course we’ve done the planning for you with five restaurant and theatre suggestions scattered across 5 towns in Marin County. The formula for the Top 5 = easy walk between dinner and the movie + excellent food in a small local restaurant + small main street style theatre. Multi-plexes have their place, but for date night we’re going for that cozy, intimate vibe. 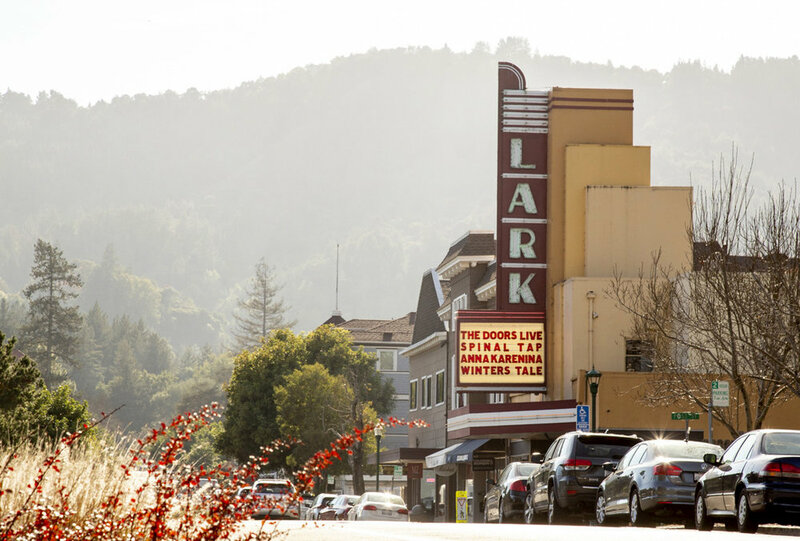 The lark Theatre in Larkspur is a Marin County gem! LARKSPUR. Dinner at Picco or Picco Pizzeria and a movie at The Lark Theatre. Walk: 4 minutes between either of these restaurants and The Lark Theatre. Restaurants: Located next door to each other, Picco takes reservations, the Pizzeria does not. And the Pizzeria is crowded until about 8ish most nights. If you want to eat at the Pizzeria, we suggest doing so after a movie at The Lark Theatre, when the crowd thins out. If it’s winter, sit indoors at the counter where the cozy is dialed up to 11 with the pizza oven. Don’t want to take your chances? Reserve at Picco the minute you know you want to go. It’s popular! EVERYTHING IS GOOD at both spots. Especially the risotto, which comes out on the half hour. And the tuna on the sticky rice cake. And any pizza (some say it’s the best in California). TRUST. Theatre: Both plush (that beautiful red interior at the top of this post is The Lark) and charming at the same time, perfect for date night. And that marquee, you’re going to want a photo of that. This small historical Art Deco theatre features an eclectic lineup with first run movies, foreign films, and special events like opera from the Met. FAIRFAX. Dinner at Village Sake or 123 Bolinas and a movie at Fairfax Theatre. Walk: 4 minutes between either of these restaurants and Fairfax Theatre. Restaurants: Village Sake is a casual Japanese pub, and a Top 100 restaurant in the Bay Area. With good reason — it was awarded a Michelin Guide Bib Gourmand in 2017. They don’t take reservations, but if you are there at 5pm, you most likely will get a table. The other option is to join the waitlist online to request a later table. 123 Bolinas is a popular neighborhood farm-to-table style restaurant. Reservations available. Theatre: The top movies with most of the popular mod cons available in a multi-plex. SAN RAFAEL. Dinner at Le Comptoir or The State Room and a movie at Smith Rafael Film Center. Walk: 1-2 minutes between either of these restaurants and the theatre. Restaurants: Get the French bistro vibe with some excellent roast chicken and frites at Le Comptoir. They take reservations by telephone only (415-454-5454); for a Thursday evening or weekend we recommend reserving. For a local brewpub experience (with excellent cocktails! and food! and super nice staff!) head to The State Room. Reservations available on their site. Theatre: This theatre is LEGIT. Art Deco meets state of the art, at this theater owned and operated by the California Film Institute, the non-profit arts organization that also produces the annual Mill Valley Film Festival. Films of all types…first run, independent, documentaries. Films you won’t see anywhere else, and films you’ll see here first. TIBURON. Dinner at Luna Blu or Salt and Pepper and a movie at the Tiburon Playhouse. Walk: For our guests at Waters Edge Hotel, the restaurants are steps from hotel and the theatre is half a block from the hotel. If you slow walk it, 2 minutes tops. Maybe hit repeat on this if you’re staying more than one night. Restaurants: Luna Blu serves Italian seafood and charm charm charm in a super cozy setting. Named one of the best 100 neighborhood restaurants in America. Yes to reservations. Salt and Pepper serves Cali-American food in a small spot on Main Street. Perfect for when you want plenty of choices — you’ll find pasta, seafood, grilled items, burgers, salads, and classics like roast chicken. Hint: for sure the Crab Stack. Theatre: Luxury. It’s Tiburon after all. Stadium style seating, with big seats and tons of legroom. MILL VALLEY. Dinner at Piazza d’Angelo or Bungalow 44 and a movie at the Sequoia. Walk: For our guests at Mill Valley Inn, both spots are about a block from the hotel. So you know, 2-4 minutes. Restaurants: Well you know how we feel about Piazza d’Angelo if you clicked on that link. Cozy and energetic at the same time, a lively date night spot. Our Pro Tip on Bungalow 44: go for $1 Oyster Hour from 5:00-6:00 every night. Heaven on a shell. Order a dozen the minute you’re seated and another dozen a few minutes later. Theatre: When you picture a main street style theatre, something like the Sequoia probably comes to mind. 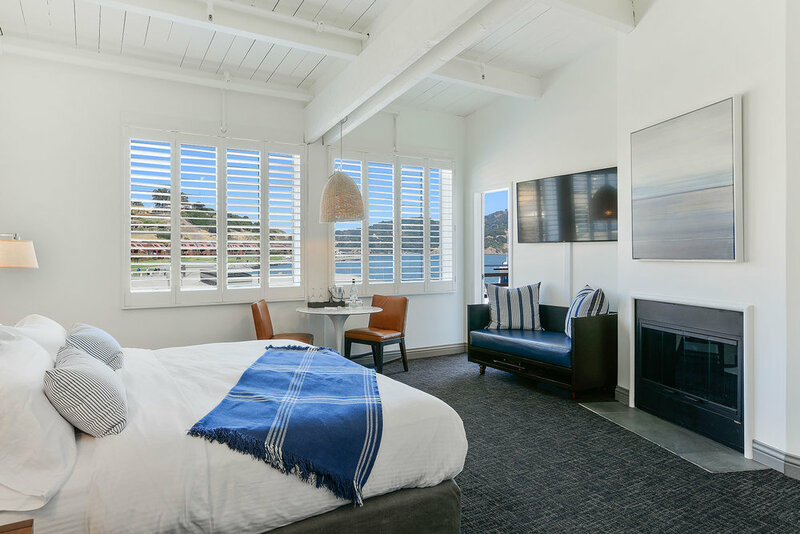 Cozy and charming, like the rest of Mill Valley.